Well, I think I've left you guys hanging on this one for just about long enough! I'm *pretty sure* that all of our save the dates are out, or I at least hope any that haven't been delivered aren't going to people that read the blog. So, remember how I told you guys that I did a lot of looking around on the Internet for source of inspiration for our save the dates? Well, I happened to stumble across one design that really caught my eye. I loved the simplicity of this card, and when I saw it, something just kind of clicked. 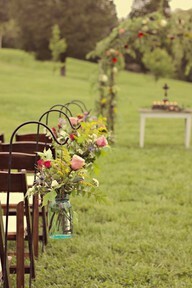 Clearly, I have been LOVING the mason jars! 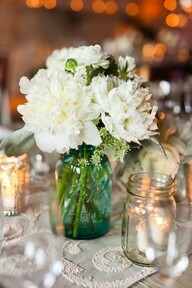 I'm hoping to use all sorts of mason jars (different colors, different sizes) throughout our wedding for flower vases, candles, etc. I have already been stashing some of my own jars, and I put out the call to family to "save the jars!" 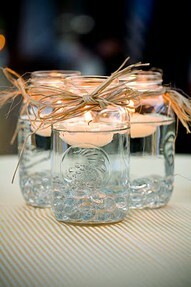 I love the rustic feel to mason jars, and I think bringing our own design pieces to the table will help save some $$ for an extra pina colada (or insert large number two) on our honeymoon. 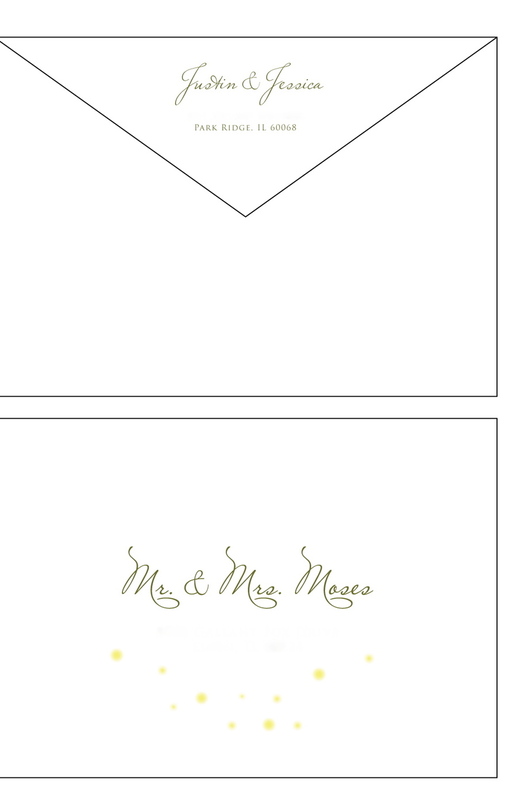 So, when I found an idea for incorporating a mason jar into our save the dates, it only felt appropriate. I also loved the look of the shimmer coming out of the jar. Obviously it reminded me of fireflies, which I used to catch as a little girl. 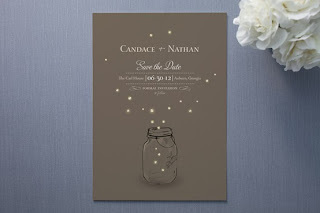 I know fireflies are more of a summer thing, and we are getting married in the fall, but there was something kind of magical about the design to me, and I just loved it. I sent the design inspiration over to Jessi at Just Invite Me, and she was able to come up with the most amazing save the dates, using the image I found, and some of our favorite engagement pictures. 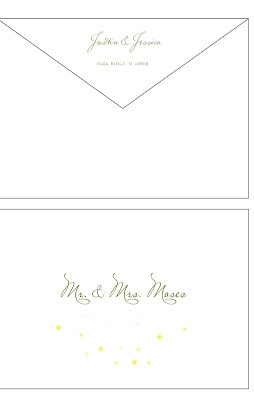 Jessi even came up with the COOLEST front and back address printing for the envelopes. I edited out the actual addresses for safety reasons, but I think you get the gist. 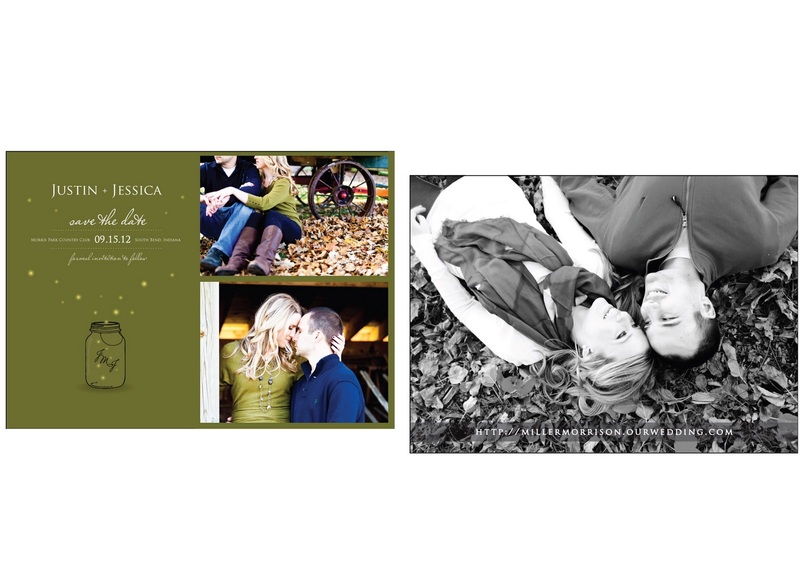 Once the cards were printed, I sent over a huge excel spreadsheet to Jessi, and she did all the address printing for us and sent out the save the dates to all of our guests. I could have been ambitious and took the project on myself, but you know, sometimes you just gotta be realistic. I'm a very busy girl these days, and it was so worth it to delegate this task to a true professional. I could not be happier with the way our save the dates turned out. We have our own copy on our fridge, and I know we will certainly be cherishing it for many years to come.